Sergio, who was not intended for a musical career, is however a world-music fan. For now 15 years, he plays percussion instruments and specially congas, "because these sounds are spellbinding and known in the whole world". Native from Brazza (Popular Republic of Congo), he began to play music with his friends in the nineties, just after the high school. He took part in the birth of the band. 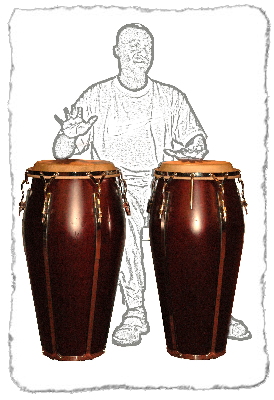 His role in the band is to add a perfume of exoticism in the "rumba variety": The slower rhythms he added with congas made their appearance and replaced the ROCK'N'ROLL variety. "Tabasco", which is the first and only band Sergio is playing with, was born during the Choisy-le-Roi Music festival. This band, which grows in wisdom, is on the way to become a real institution in the French rumba style. Sergio has been living at Paray-Vieille-Poste (a town near the "Orly Airport") for now seven years and has made this place the HQ of the band. As the band grows and become more end more popular in the area of this town, it has changed his name into "Bossa-Jade" and now includes musicians and chorus-singers who give a new breath to its career.